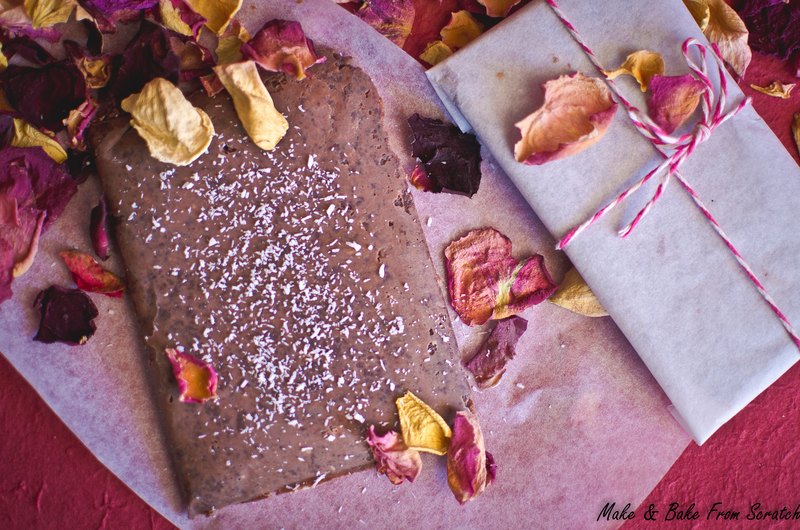 This homemade raw chocolate is phenomenal; it will ignite the party of the century in your mouth. I love chocolate and this recipe is easy to follow, there is no preservatives just pure goodness. You can add your own flavours. I added vanilla powder, pink rock salt and shredded unsweetened coconut. This recipe is gluten free and dates are used as a sweetener. How will you make yours? Remove stones from the dates and pop them in the food processor, blend until resembles a paste consistency. In a Pyrex glass dish over water in a saucepan on low-medium heat: add raw cacao butter, cacao powder, coconut oil, vanilla powder, pink salt, coconut, allow it to melt and stir regularly and combine. Remove from heat. Mix in date paste and stir until all ingredients are combined. You might need to use a fork to combine/mash the date paste. Pop the bowl in the fridge and allow to cool 15-20 minutes. You can make two medium sized slabs or one big slab from the mixture or add the mixture to molds. I made two slabs. Scoop mixture onto greaseproof paper, fold paper over mixture and spread and shape the chocolate mixture. Wrap the chocolate in the greaseproof paper, pop in the fridge and allow it to set or until you are ready to eat it. Could you tell me where I can get cacao butter in Ireland? Brilliant blog btw.